Most probably, Sri Lankan society has not heard of the term, humanitarian logistics. But unknowingly, it has very much involved in this area in the past. Be it a flood, landslide or any other disaster, Sri Lankans were highly active to provide necessary supplies and services for the affected areas. The motivation did not involve any monetary incentives, rather it was the inner happiness they received by helping the victims of such disasters. They have understood that helping out fellow citizens at difficult situations with relevant logistical support is a social responsibility. Hence, several lessons can be learnt from Sri Lankan society for effective and efficient humanitarian logistics. Tsunami in 2004 is no doubt the darkest tragedy happened to Sri Lanka in modern history. Without any alarm Tsunami roared into the coastal areas of country taking over thousands of lives. It disrupted the usual lifestyle, specially in down-south and Eastern province for months. But our society was quick to react to damage done by monstrous disaster. 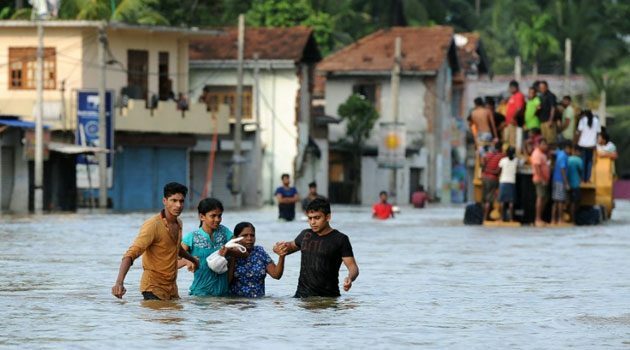 Even though, Sri Lanka is considered to be a low-income country, essential supplies were flooded to the affected areas from every part of the country. People organised health camps to help the victims to heal not only physical injuries, but also collapsed mental states. With whole villages were washed off from the tragedy, Sri Lankan volunteered to arrange funerals and give proper respect for the deceased. When the victims were left without their belongings, Sri Lankan society got together to swiftly supply essential items such as tents, medicines, in addition to food and water. Selflessness of the Sri Lankan citizens as well as their generosity is a good example in terms of societal engagement for better humanitarian logistics around the world. Tsunami had a long-term impact on the whole country. But Sri Lankan society was able to manage the disaster collaborating with governmental and non-governmental organisations to lift the damaged souls of victims. The dynamic participation from the society towards the humanitarian logistical operations sets an example for the other communities in the world. They reacted towards the situation quickly, which is considered to be an important KPI (Key Performance Indicator) of humanitarian logistics. Even though, the total cost incurred in providing supplies couldn’t be determined due to the chaotic situation prevailed in the country, cost need not to be considered the most important factor, rather priority must be given for the welfare of victims. However, there were individuals and organisations, who took advantage from this disaster to fill their own pockets from the donations given by both Sri Lankan and foreign philanthropists, without distributing those within the helpless victims. Therefore, one important lesson to be learnt is despite the difficulties of properly tracking the distribution of supplies in a disastrous situation, a procedure must be carried out to eliminate such unethical incidents. Aranayaka Landslide in May 2016 is the worst disaster happened in Sri Lanka in this decade. It took 127 lives while displacing whole village with no facilities left for the villagers. In this instance also, Sri Lankans along with several organisations were keen to help the victims by providing essentials. They took a great difficulty to move through the mud-covered area to reach sufferers. Humanitarian workers were speed enough to reach them and supplies were cost effective as businessmen were generous enough to provide necessities at discounted rates. However, the accuracy of the supplies was somewhat questionable in this disastrous situation. Supplying unnecessary items and over-provision of some essentials was observed, while some necessities were not fulfilled to the fullest. Hence, another lesson to be learnt is proper organisation for the supplies with the required quantities, so as to minimize wastage. I believe Sri Lankans are emotionally driven to volunteer such activities. However, after the initial stages of the aftermath of the disaster, they move on with their own lives forgetting about the victims. Still displaced people from Aranayaka landslide and similar disasters are in temporary places, while no one to take care of them. Therefore, when looked closely at the behavior of Sri Lankan society in times of emergencies, it can be observed Sri Lankans actively participate in short-term, but the engagement slowly fades off with time. This provide a lesson by Sri Lankans about the importance of aiding the victims until they come back to normal life. As a solution for this issue, establishment of strong humanitarian organisations can be recommended. There is always a trade-off between Speed, cost and accuracy in humanitarian logistics field. From Sri Lankan society, an insight on ways to manage those three aspects can be drawn. Even without the theoretical knowledge logistical area, Sri Lankan society serve the victims with satisfactory level in terms of logistical operations took place. They put the human factor first when taking any decisions and always worked for the welfare of the victims. In a summary, being a self-less community, rigid cost management, proper commodity handling and strengthening humanitarian logistics are lessons that can be learnt from Sri Lankan society for improved humanitarian logistics. Finally, I believe with the constant attacks toward the planet earth by disasters, taking proactive measures with in-depth analysis on the way which different societies face towards disasters is utterly important.